Engaging buyers who are interested in purchasing properties in the upper tier of the market is really about showing them how they can live out their dreams in a given home in a particular marketplace. That is why some of the most successful luxury real estate marketing professionals are those who have learned the art of storytelling. They know how to romanticize their marketplace. Human beings have been telling stories even before recorded history. 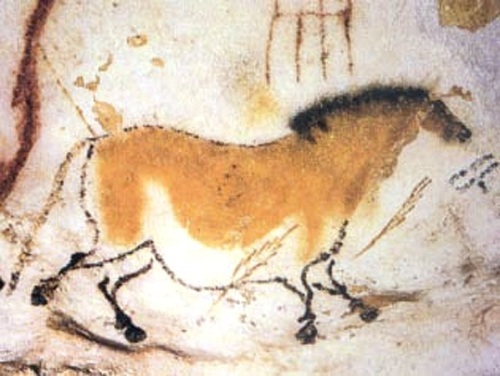 The paintings on the walls of the Lascaux Caves in southwest France, as depicted above, are estimated to be over 17,300 years old. These cave dwellers were telling stories mainly about animals which were obviously a central part of their lives. Storytelling comes naturally to some. For others, it is a skill that can be developed over time. As authors of the Language of Luxury we strive to continuously sharpen our storytelling skills as we build our audience. We also understand that every great brand tells a great story that is compelling to its customers or clients. And, we help our clients to develop their own distinct brand story. Keep your promise that your story will lead somewhere that is worth the investment of time by your audience. Your audience wants to work for its “meal”. We are all born problem solvers. We enjoy using our deductive or inductive logic. We like to think. Do not give all the answers. Let your audience solve the problems. A strong theme always runs through a well-told story. Get clear about what your theme is. A great story is uplifting in some way. Does your story evoke wonder? Does it confirm that life is worth living? What are some ways that you can become a better storyteller as a luxury real estate marketing professional? One way you might consider becoming a great storyteller is by practicing the art of storytelling in each of your blog posts. How can you romanticize your marketplace in each of your posts?